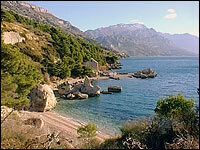 Ivasnjak - Lokva Rogoznica is a tourist destination on the breathtaking Makarska Riviera, known for its magnificent pebble beaches. 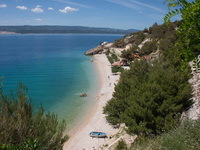 This quiet place consisting of family houses lies half way between Makarska and Split, therefore, if you are looking for a bustling tourist destination you only have to go 28 km in either direction. 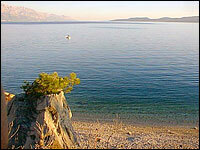 There are pebble and partly sandy beaches, ideal for children, in Lokva Rogoznica and its surroundings. Besides crystal clear waters and splendid beaches, Lokva Rogoznica offers plenty of shade in bays surrounded by pine trees. This small place is ideal for a family holiday, while there is a post office, a store and a restaurant in the vicinity of the private apartments and family houses.